Wandering Rule #2: Never forget where you are. I’ve been living and working in Olympos now for three weeks. Tyler and I split the 16-hour bartending day as we see fit which has enabled me to hike, bike, rock climb, sun bathe, star-gaze, and swim on my “breaks.” During my shift, I talk to guests, which has yet to really feel like “work.” I’ve been blessed with the opportunity to meet some phenomenal people, Aussie, Canadian, English, Kiwi, Russian, German, French, Italian, and the occasional American. I’ve formed some incredible connections with fellow travellers, each with their own story and their own journey. Although I’m rusty, I have made use of my French and Italian in order to facilitate conversation between the Turkish staff and the guests. Though I must admit that listening to a Turkish man speak to a French man in English is quite possibly the funniest conversation to eavesdrop on; their accents are so thick that despite speaking in their common language (English), neither one can understand the other. But at the end of the day, in this melting pot of culture and language, I have to confess that I’ve been speaking primarily in English and have spent the majority of my time conversing with other native English speakers. I came to a very disappointing realization yesterday: my knowledge of Turkish language and culture plateaued a while ago. I have been in Turkey for over one month, and I still can only answer “Çok iyiyim” (very well) when asked “Nasılsın?” (How are you?). I don’t know how to say that I’m tired, sad, happy, or frustrated. I know how to count from 1-10, but if you tell me to “put it on room 14,” I draw a blank. I can say hello, good morning, please, and thank you, but those are the P’s and Q’s that I pride myself on knowing before I enter any foreign country. I realize that I’m putting a lot of pressure on myself, but after one month, I should know more Turkish. I should have done a better job of diving into Turkey. What I’ve done is dive into the tourist’s Turkey. I have an amazing opportunity over the next month to fix that fault. I have a group of Turks who adore me and have so much to share. Fifteen year old Emrah loves to play his favorite Turkish music for me. “Chefy,” as we affectionately call the hostel cook, enjoys showing me what he has planned for today’s menu. Servet’s sister is getting married in a few weeks. Camil is going to be a father this summer. Memet is eager to show off his dance moves. I want to be a part of all of it. While Olympos is a fantastic getaway for tired backpackers and avid thrill seekers, I must not forget that it is home to these Turks. And right now, it is home for me too. While I’ve been seeking out new adventure sports, Tyler has been filming and documenting our lives here in Olympos. He is incredibly talented and has an uncanny ability to pick the perfect scenes and music for each video. Check out his most recent video, and experience a day in our lives. The ancient city of Olympos, the first of six cities in the Lycian Federation, dates back to the 2nd century, B.C. Today its scattered ruins are hidden by wild grapevines, just waiting to be re-discovered. Structures this old are typically protected and preserved by keeping visitors at a distance. Not Olympos. For only 3 TL ($2.10), you can crawl under archways or trace your fingers along the Marcus Agrippa dedication. I might be a Roma-phile, but that is just the coolest thing ever. 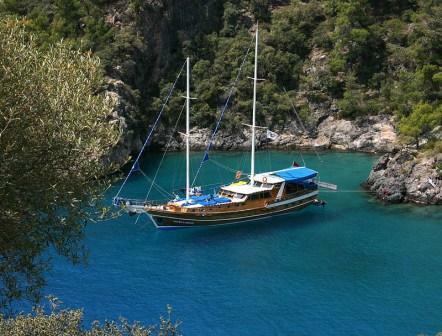 A mere 500 meters from the Mediterranean in Turkey’s Turquoise Coast, Olympos is now a sleepy village tucked away alongside a fig-shaded stream in a stunning valley between high cliffs. There are no ATMs, no post office, only a few shops, and the only transportation available is a large van which shuttles people 11 km up the valley to the Main Road, and it only operates once every 2 hours between 9am and 7pm. Every morning, I wake up to the smell of sage, oleander, and orange blossoms (which smell surprisingly like Gardenia). I hear the sound of chirping birds and a cool spring breeze. I have found my paradise. 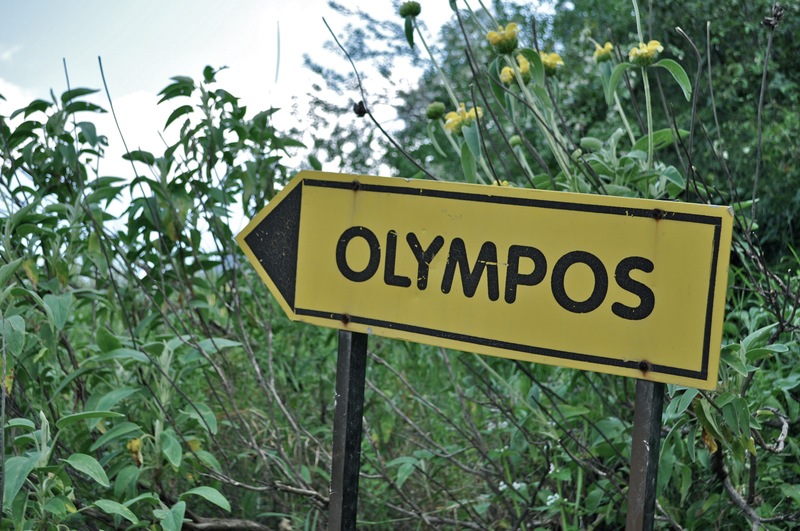 I chuckle when I overhear the question: “What is there to do here?” You don’t come to “do” anything in Olympos. That’s the point. Hike if you like, swim in the Mediterranean or walk among forgotten ruins if you like, lounge in a hammock or play backgammon…but more than anything, you should come here without an itinerary and without a plan. In the 10 days that I’ve now lived and worked here, I have done precisely that: nothing. And it is perhaps the first time in my life that I can say I’m actually relaxed. After the guest left, Yusuf leaned over and said, “You don’t need to ask me. The answer is always ‘Sunny. '” And what if it rains? “Then you just shrug your shoulders and say, “ehh, it’s crazy weather. It will be sunny again tomorrow.” This is the attitude of this village. The mantra of the hostel is “Come for a Day, Stay for a Week.” If that’s true, what happens when you come for a month? I’ll let you know. Wandering Rule #1: Expect the Unexpected (a.k.a. STOP trying to make a “plan”). When you just let things happen and keep an open mind, the most incredible opportunities appear. To be honest, so much has occurred in the last 8 hours that I’m not quite sure how to go about writing it. I’ll summarize by saying that while my work opportunity in this hostel is still an option, after recent developments it is no longer appealing (yes, I am very safe). I woke up prepared to settle with Plan B which meant spending some money to check out a work opportunity on the coast…knowing full well I’m not ready to leave Istanbul. Insert one stop at a travel office, a manager named Mustafa, and an Irish ex-patriot name Kathy. Thirty minutes and a cup of apple tea later, I have in my pocket directions to a nearby hostel. The manager is expecting me. He is a friend of Kathy’s and he’s looking for some extra help from a native English speaker. One hour and another cup of apple tea later, I have an offer for free accommodation, all meals, and a possible “salary” in return for some help with guests and reservations. The hostel is an incredible upgrade – clean, fresh, warm, and welcoming. And to think…if I had stuck with this morning’s “Plan,” I would have missed an opportunity to live in Istanbul for a month for free.